Although you probably already monitor the condition of your fleet, it is still a good idea to get regular CatⓇ equipment inspections. Equipment inspection is not just about making sure your fleet is compliant, but can save you money and time in the long run. It usually costs a lot less to have equipment repaired than replaced. Inspections help prevent major repairs, or even worse — equipment failure. With regular inspection, you make sure your equipment is in top shape and can handle the toughest jobs. A trained technician can determine if small repairs will make a big difference and can suggest repairs to help your equipment run more efficiently. An equipment inspector may point out details your team might tend to overlook. Most importantly, regular inspections ensure the safety of your workers. You can get projects done on schedule and with peace of mind, knowing your equipment is in good condition. When it comes down to it, there is no reason not to have regular inspections and get the most out of the investment you made in your heavy equipment. Still not convinced? 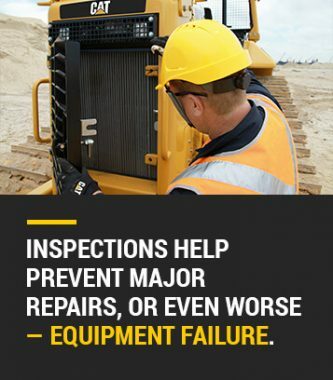 Keep reading to learn more about inspections and why they are critical to your heavy equipment lifespan. What Is Checked During an Equipment Inspection? Heavy equipment inspections combine data collection and analysis with hands-on testing and examination for a thorough look at the equipment’s condition. A complete inspection is an important preventive way to make sure equipment is safe for use and that all systems are working properly. The Occupational Safety and Health Administration (OSHA) requires each piece of heavy equipment to pass inspection before use. If any of the safety features are in disrepair, you should not use the equipment. Employers are required to get unsafe equipment repaired to ensure worker safety. Although heavy equipment owners have the option of maintaining only the minimum to meet OSHA requirements, they shouldn’t overlook other details if they want their equipment to last. Heavy equipment can last for years if properly maintained. Considering some heavy machinery costs more than a house, it is a smart move to take utmost care of these powerful tools. Get the most out of your investment by conducting regular inspections on your own or with a trusted technician. MacAllister Machinery uses cutting-edge technology and hands-on expertise to inspect, collect, analyze, diagnose and monitor equipment. When combined with other information, like machine history and use, we have all the tools we need to suggest repairs and maintenance for optimal safety and performance. 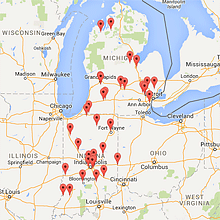 It is easy to access and view inspection results, too. Just log in to the Cat Inspect app or VisionLink to take the next step or review results. Heavy equipment inspectors check all the components of a piece of equipment, emphasizing safety. A technician can not only test for safety, but can also consider ways to increase equipment productivity and efficiency. Once you’re certain of safety, it is up to you what you want to accomplish with your equipment. Our inspections are tailored to meet your specific needs. Heavy equipment is a significant investment, so it is worth fitting maintenance and inspections into your work schedule. You’ll potentially save yourself thousands of dollars in repairs. Get ahead of the game and save yourself the trouble of dealing with failed equipment. Sometimes, the value of expert advice is priceless. An expert is more likely to notice when parts or systems are damaged beyond what an untrained eye can spot. It is not uncommon for heavy equipment to break down, and the majority of the causes are preventable. Here are some of the top reasons heavy equipment breaks down. Poor maintenance: Failing to replace belts or forgetting to check oil levels, for example. Poor electrical connections: An inspector can detect electrical issues early, before equipment breaks down and causes you to lose work. Not replacing worn parts: By fixing only one broken part, you are only temporarily taking care of the issue. Other worn parts need to be inspected to prevent further damage and future costs. Ignoring warning signals: Always ask a technician to investigate a warning signal. Ignoring a warning signal can lead to major equipment damage or serious injury. An inspector will run tests, collect diagnostic codes, analyze data and visually inspect the equipment to checks for leaks, broken or loose parts, excessively worn parts or any potential problem areas. With an inspection checklist in hand, either on a device or paper, a technician will make sure they don’t miss anything, and they will teach your team what to look out for during daily checks. What Are the Benefits of Equipment Inspections? Equipment inspection is not something to dread. Inspection is an opportunity to save money, prevent injury and stand out from competitors. Your productivity is only as good as your equipment is, and you can’t get very far with broken equipment or out-of-work employees. Regular inspections take productivity and safety to the next level, beyond mandatory inspections. Heavy equipment is a powerful tool that undergoes a lot of different conditions and completes amazing tasks. With the incredible work a piece of equipment can do, like lifting tons, wear and tear are inevitable. Plus, no matter how great your team is, sometimes packed schedules can lead to equipment abuse and misuse. Worn or damaged components are not always apparent. Regular inspection makes sure equipment is still in great condition, despite being used by multiple workers under difficult conditions. Considering the costs of heavy equipment repair and replacement, the pros of frequent inspection far outweigh the cons. If you wonder about the condition of your equipment, do not hesitate to contact a qualified technician immediately. Here are the reasons why. 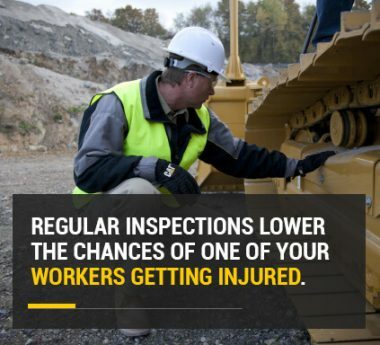 Regular inspections lower the chances of one of your workers getting injured. Unfortunately, injuries do happen on the job, and most of the time, they are preventable. Inspections are a preventive safety measure for you and your employees. Consider that in 2016, there were 4,693 deaths in private industry, according to OSHA. About 21 percent of the deaths occurred in the construction industry. Excluding highway injuries, the leading causes of construction workers’ deaths were the “fatal four” — falls, struck by an object, electrocution or caught between two pieces of machinery. Eliminating the fatal four could save 631 lives each year in America. Now, consider how failing equipment could play a part in these statistics. A failed horn, brakes or any other important component could lead to a crash, or a vehicle driver striking another worker. A collision or failed system could cause a heavy object to fall and lead to injury or death. Or, a worker could become distracted by broken-down equipment and less aware of nearby workers, putting their safety at risk. If brakes fail or if equipment suddenly shuts down, it could easily cause a dangerous chain reaction to occur. Although your equipment might be in great shape one day, you’ll want to have it inspected after a tough job. If it does need a repair, don’t wait — make repairs immediately and play it safe. If a worker gets injured as a result of damaged equipment, chances are, they are going to miss some time. Common injuries relating to heavy equipment are often serious, such as amputations, spinal injuries, sprains, fractures and cuts. Workers who suffer any of these injuries could be out for days. According to a 2015 Bureau of Labor Statistics news release, workers who sustained sprains or strains resulting from a workplace injury required 10 days off work, on average. Workers with fractures needed 31 days, and those who suffered amputations required 22 days or more. Even less severe injuries could lead to lost time. To stay on schedule, you will have to find someone to make up for the lost worker. If you are not able to find someone, productivity can slow down substantially. If a worker is severely injured, they might need a long time to recover, or they may never return to the jobsite. In such a case, you will need to replace the worker with someone new. Whenever you hire a new employee, you take a chance. Even when the new hire is a good fit for your company, it almost always comes with a price. New workers usually need training and time to adapt. It could also take a while to find a worker who is right for the job. According to a 2016 survey by the Society for Human Resource Management (SHRM), it takes 42 days to fill a job vacancy with a new employee, which is a lot of time with insufficient staff. New employees cost money, too. 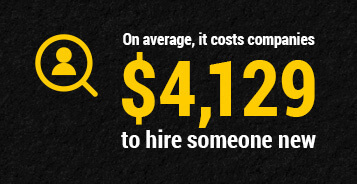 On average, it costs companies $4,129 to hire someone new. Even if you think you’ve found the perfect worker, there is no guarantee they’ll stick around to see a project through. According to the SHRM survey, the average annual turnover rate is 19 percent. Considering an employee who makes $8 an hour could wind up costing a company $3,500 in turnover costs, your best bet is to try to keep the employees you have. Inspecting your equipment regularly is just one aspect of best practices. Workers’ compensation means employers are required by law to pay for workers’ compensation benefits if a worker gets hurt on the job. Injuries can be from one event or repeated injuries, such as those caused by regular exposure to chemicals or loud noises. Sometimes, workers’ compensation even covers psychological stress. When an employee files a workers’ compensation claim, your workers’ compensation premium increases as a result. Injury can also affect health care premiums. However, if your claim costs are lower than average compared to similar companies, your premium may decrease — more incentive to keep your equipment fully intact. Regular inspection allows you to take care of your equipment and even greater care of your workers. Avoid fines and serious violations with regular inspections by ensuring safety at all times. Under OSHA law, employers are responsible for maintaining safe workplaces for their employees. If you ignore safety, you break the law. For example, in 2012, OSHA cited a heavy equipment rental company in Hawaii for serious safety violations after a crane fatally crushed a worker. An OSHA inspector found outriggers meant to stabilize the crane were not extended, allowing the crane to tip. The company failed to inspect and keep a record of vital crane components. The company also allowed a worker to use the crane when it was displaying a warning indicator. Also, other equipment was not properly maintained or guarded to prevent amputation or injury. OSHA set fines totaling $70,000. Not only did this company have hefty fines to pay, but they lost a worker and impacted their business name — all of which they could have prevented if they had put safety first. Clearly, it is not worth taking a chance when it comes to heavy equipment. There are plenty of ways you could legally be liable if equipment fails and causes injury. For example, if a worker is injured and sent home, and if you hurriedly hire another worker to help your team finish a project on time, you might be putting yourself and workers at risk if the new employee is unqualified for the job. If the new worker causes harm to another worker, you could be held liable for hiring someone who brought danger to other employees. Another way you could be liable as an employer is if you are aware your equipment needs repair, even if it had passed a mandatory inspection, but fail to repair it. If someone is injured, you could be liable for negligence. Although safety is a priority, consider how damaged equipment can also affect productivity. When equipment fails, the workflow gets interrupted, and projects come to a halt. It’s impossible to complete a job if even one piece of equipment has broken down. When projects are interrupted, you might not be able to stick to your schedule and meet deadlines. It is important for customers to know they can depend on you, and regular inspections help make sure your equipment is reliable for you, your workers and your clients. To stay on schedule and meet your goals, you want to have all equipment working optimally. Also, downtime is costly. According to Farm Industry News, downtime due to equipment breakdowns costs companies around $1,400 a day during planting season. Failure to get equipment inspected before use is the biggest reason the equipment breaks down. In general, machinery failure is usually due to one of the following. Thermally induced failure: Equipment overheats, or extreme temps cause equipment to break down. Mechanically induced failure: It is easy to prevent this with inspection and replacing parts. Mechanically induced failure often happens due to overexertion, collision and misuse or abuse. Erratic failure: Occurs randomly due to harder-to-detect reasons, such as electrical issues or software malfunction. Erratic failure can be prevented with the help of diagnostic equipment used during inspection. Equipment failure can be sudden or gradual. Inspections are important because you may not notice the seriousness of an issue until it’s too late. By regularly having a professional check your equipment, you prevent disaster and make informed choices. You can replace parts when necessary and not wait until equipment breaks down in the middle of the workday to make repairs. As a result, you decrease unscheduled downtime and improve productivity. Your clients will be impressed when projects are safely finished on time. With regular inspections performed by a trained technician, you will be able to make a repair before it leads to a much more expensive problem. Your equipment will run better, and you’ll extend its lifespan significantly with inspections and maintenance. The better condition your equipment is in, the less time you’ll need to spend on repairs, and the more work you can get done. Ultimately, you will get a greater return on your investment if you run highly efficient equipment for a longer amount of time. Consider the circumstances in which you use the equipment. What is the environment? What are the weather conditions? You may need more inspections and maintenance than you might think. Small repairs are often worth the time and cost because heavy equipment is not cheap to replace. Considering a bulldozer can range in price from $30,000 to more than $200,000, it only makes sense to properly maintain something so valuable. When and Why Should You Do Inspections? When in doubt, get your equipment inspected by a trusted professional. MacAllister Machinery makes it easy to schedule inspections through Cat Equipment Management (EM) Services Level 2: ADVISE. With Cat EM Services Level 2, you will have direct access to expert advice and recommendations regarding the maintenance and care of your heavy equipment. In conjunction with your custom equipment monitoring program, you can schedule, administer and document equipment inspections performed by your team or a MacAllister Machinery expert. Inspection results are available through the Cat Inspect app or VisionLink system. Do not wait to check your equipment for important repairs. Take preventive measures and save yourself money, time and headaches down the road. For a free inspection, fill out our free inspection request form or contact MacAllister Machinery today.